Something that has concerned us lately is the amount of poor information from reviews promoting the best garage floor epoxy or garage floor coating kits. Many of these reviews are misleading the consumer by stating that the coatings listed are the best, when in most cases they are not. They present these DIY coatings in a nice list with the pros and cons of each, while discussing brands such as Rust-Oleum, EpoxyShield, Valspar, and others. The type of reviews that we are referring to are the ones most known for providing the top ten or top 5 best products. These are published by websites that can look very official and trustworthy at first glance in order to try and assure their authority about epoxy coatings. We don’t have an issue with quality platforms that evaluate and review various products with which they have considerable knowledge and/or experience. Some of these websites even purchase products for testing and evaluation first. If you view their “About” page, you can learn more about who they are as well as their experience or qualifications in regards to their content. However, we have found that consumers are being misled with bad or inaccurate information regarding garage floor epoxy and coatings in general. As a result, we want to make our readers aware of what to look out for. One of the many issues we have is that most of the websites listing the top garage floor epoxy have no floor coating experience and/or little to no knowledge of floor coatings in general. As an example, one such author lists his experience as an “enthusiast of cars and pretty girls”. Hmmm…. I can’t even comment on that. Another is an activist for green space. We think wanting to create more green space is nice, but it doesn’t make you an expert on garage floor coatings. Another such website claims to be a logistics company of some sort with an extremely vague mission statement that frankly makes no sense. There are no references either (that we could find) to its experience with any of the “best products” it writes about. A common theme among all these reviews is that they take the information found in the literature of each manufacturer’s epoxy coating and then restate in their own words these same features. Nevertheless, they do a poor job of explaining the benefits of each of these features and why one would be superior over the other. They then create a professional looking list that ranks them in an order that, most often, is contrary to their actual performance characteristics in relation to each other. This in itself is irresponsible. In addition, few if any of these sites allow a platform to answer questions by readers. Some of our “Comments” sections in our articles have hundreds of questions from readers answered by us. Furthermore, the only floor coating products that many of these websites include in their lists are those that can be found on Amazon. This is an example of misleading the consumer as well. 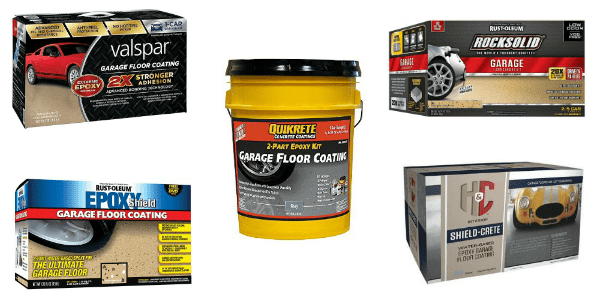 The reason is that the garage floor coating products available from Amazon only represent a very small sample of the large variety of concrete floor coating products available today. Just take a look at our own category for garage flooring reviews as an example. Furthermore, the majority of these top epoxy lists are the low budget, low quality coatings that are mass marketed as DIY epoxy kits. This includes products by Rust-Oleum, EpoxyShield, Valspar, DryLok, Kilz, Quikrete, and others. Examples of residential quality epoxy kits. Most of these are considered residential quality coatings and not commercial grade like you would get from a quality vendor or professional installation. Because these large companies have the budget for advertising, these best epoxy lists only contain the brand names that people are familiar with. They by no means comprise of the finest garage floor epoxy or garage floor coating options that are available today. This article about home improvement DIY epoxy kits provides a good explanation as to why. Furthermore, very few of these epoxy coating reviews list any valid information from manufacture technical data sheets to support their rankings in regards to performance characteristics. Examples are abrasion ratings, chemical regent tests, hardness, stain resistance, dry film thickness and etc. As we stated earlier, we have often found that the order in which they list the best epoxy is incorrect as well. For example, one such site lists 100% solids epoxy at the bottom of their list and a low solids water-based epoxy at or near the top. The 100% solids epoxy product will last 4-5 times longer than the water-based epoxy and the higher price point reflects that. However, the average consumer is not aware of this fact and can be led to believe that the lesser priced water-based epoxy is a great deal, when in reality it is not. Another example of misleading information is one such author that lists a polyurethane coating in its top ten garage floor coatings. They take the time to explain (in the wrong context) as to why it is better than many epoxy products. The problem, however, is that polyurethane does not adhere well to concrete and is designed as a high performance top coat to be applied on top of epoxy. The unsuspecting consumer may purchase and apply this to bare concrete only to have problems with it peeling up. Some even list 1-part epoxy paint as better than epoxy. This technically isn’t even an epoxy coating and is not superior over a true epoxy in any way. What is a good garage floor coating then? The best coating for your garage floor is always going to be a commercial grade product and not a residential grade product like most that are listed in these top ten reviews. the best brand of 100% solids epoxy coatings is the one that is on sale at the time. To be fair, we have an article about choosing the best garage floor coating. However, we list the best garage floor epoxy and coating systems – not brands. We discuss the benefits and properties of each type of coating, how they are used in systems, and the performance you can expect from each. We don’t rank what brand is best overall. The reason is because brand A and brand B often times are almost identical in their formulations, though some will vary. For example, a 100% solids epoxy color coat can be very similar from brand to brand. The data sheets many times will support this. One could argue then that the best brand of 100% solids epoxy coatings is the one that is on sale at the time. Most of these commercial grade coatings and coating systems are available for purchase from concrete floor coating vendors online. They don’t have brick and mortar stores all over the country that people can visit to select product. They are specialists in a relatively small field that can answer your questions and make proper recommendations. People tend not to be familiar with these vendors or brand names because they don’t have the resources to market nationally like the large corporations pushing low budget epoxy. You can find examples of these types of vendors and companies from our sponsors that advertise on the right-hand side of our website. None of these companies sell low quality product. Home improvement centers do not carry these brands or type of coatings because they are more expensive (higher quality) and require experience and knowledge of the seller to provide the proper customer service. We actually discuss why home improvement centers do more harm than good when it comes to floor coatings. If you look through our garage flooring reviews, you will see that some of the products discussed were tested (unscientifically) ourselves when it was feasible. For those that we could not test, we often break down the specifics of the products and evaluate them based on the data sheets and our experience with similar products. We had a hard time finding any examples of such evaluations from any of the websites promoting the top epoxy coatings. One thing that needs to be considered as well is that the best garage floor coating sometimes is only what one can afford. This is when lesser quality coatings make more sense for some people. However, do not expect these to last for years, despite what the box and top ten sites state, and do not expect them to provide the type of performance that the higher quality coatings do. This is why we feel it is important to take a little bit of time to educate yourself about garage floor coatings in general before making a decision. When searching for the best garage floor epoxy, remember to take this information into account. Knowledge is king. The more you learn about the general specifics of coatings, the more apt you are to choose what is best for you and your project. I have been looking at garage floor coaitngs and feel that the Epoy coat is a good product. Can you tell me if this is a reasonable project for an experienced do it yourselfer to tackle? Our garage floor is 800 sq. ft.
Hello Robert. Applying a good performing garage floor coating isn’t difficult for an experienced DIY’er. You just need to pay attention to the details and plan your steps. That said, Epoxy-Coat is a good choice for a garage floor coating product. We actually did a review on Epoxy-Coat here. I appreciate the detail in this article. Well written and to the point!